This study looked at the products of a series of reactions involving the synthesis of the MAX phase Cr2GaC via a carbothermal reduction reaction. 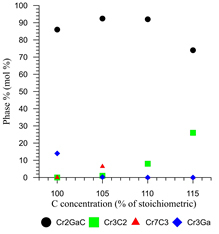 Varying the amount of C available changed the products from the carbon deficient Cr3Ga to the C rich Cr7C3. The quantitative plot easily allowed optimisation of the system. 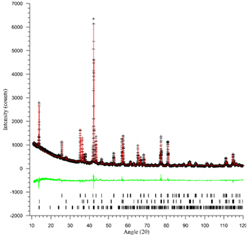 Figure 1 Refined XRD data. Black + are collected data, red line is calculated, green line is the difference plot and the markers at the bottom indicate peak positions for the different phases in the sample. This data was used to determine the phase composition of the three phases in the sample. Figure 2 Plot of relative phase compositions of different samples created by modifying starting reactants. A refinement (shown above) was performed on each sample and relative phase quantities were determined. This allowed the optimum starting ratios (107% C) to be easily determined.